Dancin’ Annie is Bill’s fourth album for Rural Rhythm Records which also includes his solo album Eclipse from 2011. The new album contains 12 songs featuring two new original songs by renowned Bluegrass and Country songwriters Pete Goble and Leroy Drumm; “Days When You Were Mine”, “This Heart You Have Broken”, Bill Emerson’s instrumental “State Line Ride”, “He Knows My Name” by Rob Mills, “Two Hands On The Wheel” by Nancy Pate, and two songs from Sweet Dixie band members “Dancin’ Annie”, the first single, by Chris Stifel and “Whistle Stop” by Wayne Lanham. 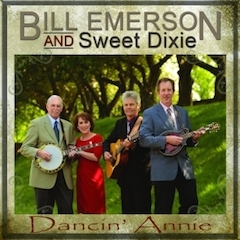 Called a “Banjo Legend” by the Washington Post, Bill Emerson is certainly one of the most influential musicians in Bluegrass music and certainly shines along with his Sweet Dixie group on their new single “Dancin’ Annie”. Bill Emerson embodies the best of what bluegrass music is all about. “Dancin’ Annie” couples Bill’s precise, crisp banjo playing with soulful vocals to give the listener nearly three minutes of bluegrass perfection. It’s excellent – Kyle Cantrell, SiriusXM Bluegrass Junction. “Dancin’ Annie” is an acoustic blend of traditional and contemporary Bluegrass, classic Country, dynamic instrumentals and rich gospel songs featuring three distinct lead singers; Chris Stifel, Teri Chism and Wayne Lanham. “Dancin’ Annie” is available to DJ’s on AirPlay Direct. The CD album is available on Amazon and wherever CD’s are sold and the digital album is available on iTunes, Amazon and other digital suppliers.